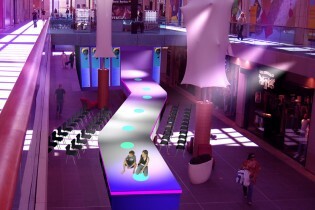 We built this set for a series of fashion shows at Liverpool’s Metquarter Shopping Centre. The set included a 15m x 2.5m catwalk and was constructed using some of our extensive range of stock Hangar Staging. It was finished off with a white gloss dance floor incorporating a polycarbonate detail which was inserted into the floor to allow for up-lighting. We also built a changing room to the rear of the set.